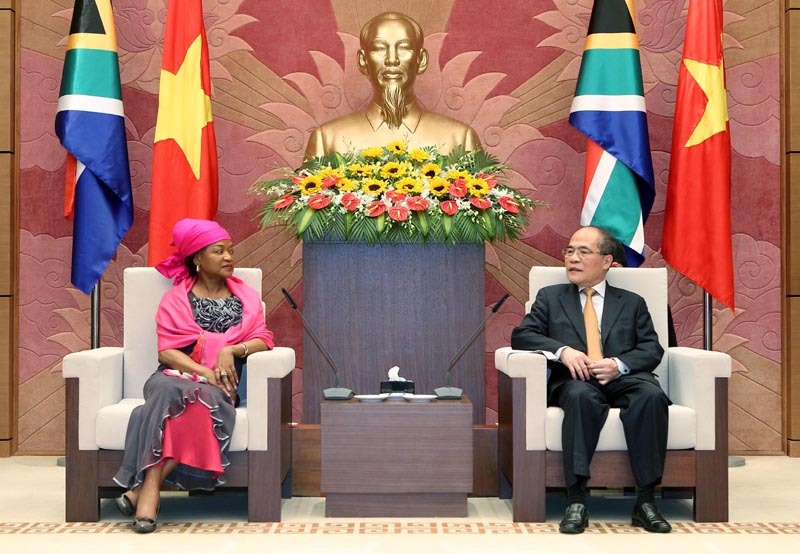 HA NOI (VNS) — National Assembly Chairman Nguyen Sinh Hung received Baleka Mbete, Speaker of the National Assembly of South Africa, in Ha Noi yesterday. The Chairman said that Viet Nam attached importance to its relationship with South Africa and spoke highly of the "Partnership for Cooperation and Development" established in 2014. He expressed his hope that the South African National Assembly would support and encourage the two governments to co-operate and tap into their relationship potential. The two nations needed to work more on researching and applying biotechnology, and exchanging experience on ocean science and environment protection, he added. Mbete praised Viet Nam's preparation, organisation and agenda for the 132nd Inter-Parliamentary Union Assembly.